These are the small hardy wild versions of our indoor cyclamen. They delight in part shade and flower from September to April. They make excellent winter ground cover plants with attractively marbled leaves. They spread by seeding. We send the tubers as dormant plants in early autumn or again towards the end of their growing season in the early spring. 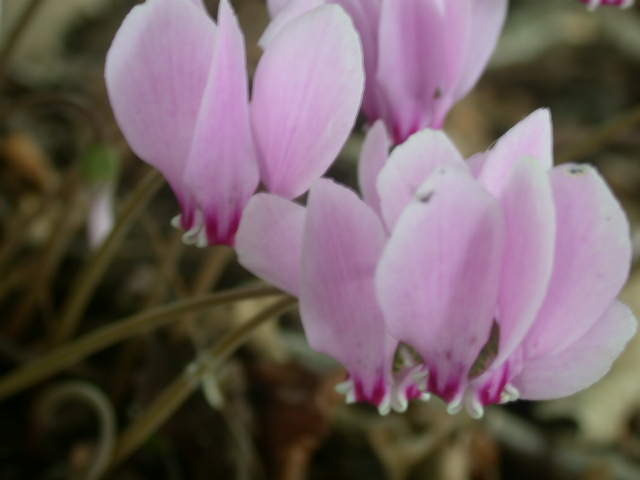 This excellent, hardy winter-flowering cyclamen will slowly spread to give a carpet of colour under trees or shrubs. Pink, white or crimson flowers and neat round leaves. The silver leafed form of this popular winter flowering hardy cyclamen. Round leaves and tubby, flowers in shades of pink and white. Excellent for growing round the base of a tree in a humus rich soil. They leaves appear in late autumn and persist until the spring. We also sell them in the Spring Catalogue. The white flowered form of this popular winter flowering hardy cyclamen. Round leaves and tubby white flowers with the characteristic dark nose. Perfect to naturalise round the base of trees or under shrubs. They leaves appear in late autumn and persist until the spring. We also sell them in the Spring Catalogue.